I was called around 6pm to attend Chrystal's birth [very last minute]. I had just picked up my son, Ezra and was headed to the gym my daughter does cheerleading at to watch her practice, but had nothing else going on at the time. I said I would absolutely love to be there, and called my mom to meet me so I could drop Ezra off. I arrived at their home around 6:30-6:40, texted my midwife friend Galyn I was there and nervous to go in. Amanda came out and immediately eased my worry and brought me inside. When I got in, I met Bobby, Chrystal's husband and we waited while Galyn was checking Chrystal. She came out, let us know that she was pretty far along and her water had just broken. I went into the room Chrystal was laboring + birthing in and was introduced. From there, things started happening really quick. In a hurry, Galyn and Bobby tried to get the tub filled so Chrystal could have a water birth and Amanda was assisting Chrystal through contractions. Chrystal started to bear down and Annabelle was on her way. There wasn't enough time to get the tub filled. Annabelle made her way Earth Side at 7:09 pm on February 15th. 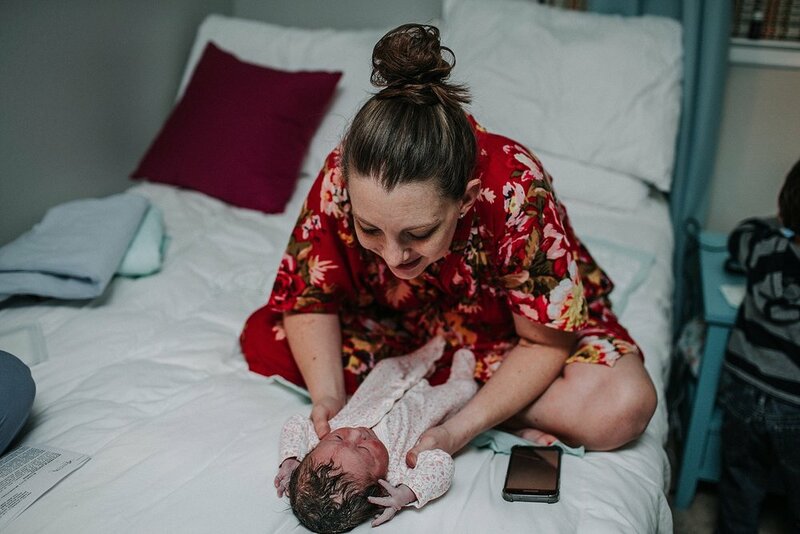 Amanda, Galyn's assistant was able to complete her first solo birth delivery and Chrystal reached down to pull Annabelle up to her chest to meet her baby girl. Big brother Benjamin came in to meet his new sister and a family of three became a family of four! While Crystal and I didn't get a chance to meet before her birth but that didn't stop a great experience and friendship from starting.